For a limited time, snap up our Pokémon™ GO Frappuccino® Blended Beverage. 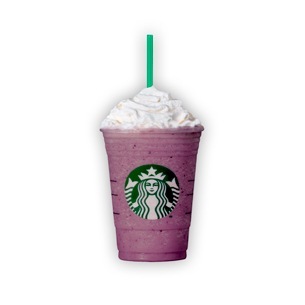 We start with a vanilla bean base, then blend in raspberry syrup and freeze-dried blackberries, and top it off with whipped cream. Ice, Milk, Crème Frappuccino Syrup [Water, Sugar, Salt, Natural And Artificial Flavor, Xanthan Gum, Potassium Sorbate, Citric Acid], Whipped Cream [Cream (Cream, Mono And Diglycerides, Carageenan), Vanilla Syrup (Sugar, Water, Natural Flavors, Potassium Sorbate, Citric Acid)], Vanilla Powder [Sugar, Natural And Artificial Flavor, Vanilla Bean Pieces], Raspberry Syrup [Sugar, Water, Natural And Artificial Flavors, Potassium Sorbate, Citric Acid], Freeze-dried Blackberries. Pokémon GO is property of The Pokémon Company and Niantic, Inc.